I live on a small farm nestled in the Ozark Mountains in Arkansas. I have a deep passion for the beauty of the earth which surrounds me and a spiritual kinship for the animals who share the mountains with me. I come from a long line of hill people with generous amounts of Kiowa and Cherokee blood thrown in to inspire me. My tribal name means Little Hummingbird. The bringer of joy. I started selling my art when I was still in high school. After spending decades doing art shows and portraits I stopped working for seven years to care for my ailing Dad and elderly grandmother. During the trials of being a full time caregiver my horses kept me centered and somewhat sane. 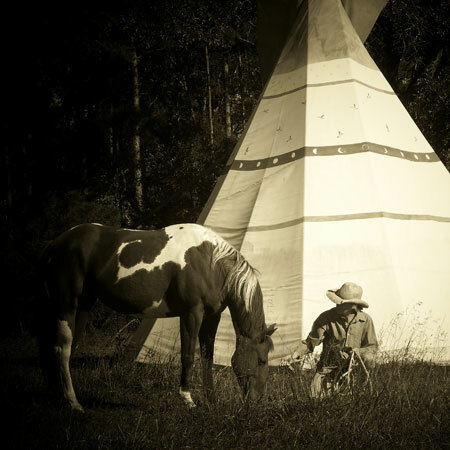 After the loss of my elders I decided to create a body of work that reflected the heart connection and healing power of horses. I am humbled by the reaction to the Spirit Horses and grateful to all my amazing customers. With your generous support I continue to spread my joy.